The Continuing Decline In College Wages-- Michael Mandel of Business Week. America's Most Overrated Product: Higher Education --Marty Nemko, a career counselor based in Oakland, Calif., and has been an education consultant to 15 college presidents. This material is from the U.S. Department of Labor Material, links provided. from pages 80-81 of the Oct. 20, 2007 issue of The Economist. The article tries to explain why 50 years of spending more on education has not made a measurable difference in the scores. Editors answer is our politically correct society will not accept sin one of the The Ten Deadly Sins of Education. Click here to see the five reasons not to go to college. 10 Reasons Not to Go to College Some reasons apply to the very bright and/or talented who can better use their time. Materials collected by Walter Antoniotti, creator of the Free Internet Libraries, author of the free Quick Notes Learning System books series, and President of 21st Century Learning Products. THE British government, says Sir Michael Barber, once an adviser to the former prime minister, Tony Blair, has changed pretty much every aspect of education policy in England and Wales, often more than once. �The funding of schools, the governance of schools, curriculum standards, assessment and testing, the role of local government, the role of national government, the range and nature of national agencies, schools admissions��you name it, it's been changed and sometimes changed back. The only thing that hasn't changed has been the outcome. According to the National Foundation for Education Research, there had been (until recently) no measurable improvement in the standards of literacy and numeracy in primary schools for 50 years. England and Wales are not alone. Australia has almost tripled education spending per student since 1970. No improvement. American spending has almost doubled since 1980 and class sizes are the lowest ever. Again, nothing. No matter what you do, it seems, standards refuse to budge (see chart). To misquote Woody Allen, those who can't do, teach; those who can't teach, run the schools. Why bother, you might wonder. Nothing seems to matter. Yet something must. There are big variations in educational standards between countries. These have been measured and re-measured by the OECD's Programme for International Student Assessment (PISA) which has established, first, that the best performing countries do much better than the worst and, second, that the same countries head such league tables again and again: Canada, Finland, Japan, Singapore, South Korea. Now, an organisation from outside the teaching fold�McKinsey, a consultancy that advises companies and governments�has boldly gone where educationalists have mostly never gone: into policy recommendations based on the PISA findings. Schools, it says*, need to do three things: get the best teachers; get the best out of teachers; and step in when pupils start to lag behind. That may not sound exactly �first-of-its-kind� (which is how Andreas Schleicher, the OECD's head of education research, describes McKinsey's approach): schools surely do all this already? Actually, they don't. If these ideas were really taken seriously, they would change education radically. Begin with hiring the best. There is no question that, as one South Korean official put it, �the quality of an education system cannot exceed the quality of its teachers.� Studies in Tennessee and Dallas have shown that, if you take pupils of average ability and give them to teachers deemed in the top fifth of the profession, they end up in the top 10% of student performers; if you give them to teachers from the bottom fifth, they end up at the bottom. The quality of teachers affects student performance more than anything else. Yet most school systems do not go all out to get the best. The New Commission on the Skills of the American Workforce, a non-profit organisation, says America typically recruits teachers from the bottom third of college graduates. Washington, DC recently hired as chancellor for its public schools an alumna of an organisation called Teach for America, which seeks out top graduates and hires them to teach for two years. Both her appointment and the organisation caused a storm. A bias against the brightest happens partly because of lack of money (governments fear they cannot afford them), and partly because other aims get in the way. Almost every rich country has sought to reduce class size lately. Yet all other things being equal, smaller classes mean more teachers for the same pot of money, producing lower salaries and lower professional status. That may explain the paradox that, after primary school, there seems little or no relationship between class size and educational achievement. AP Asian values or good policy? McKinsey argues that the best performing education systems nevertheless manage to attract the best. In Finland all new teachers must have a master's degree. 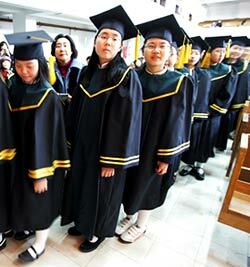 South Korea recruits primary-school teachers from the top 5% of graduates, Singapore and Hong Kong from the top 30%. They do this in a surprising way. You might think that schools should offer as much money as possible, seek to attract a large pool of applicants into teacher training and then pick the best. Not so, says McKinsey. If money were so important, then countries with the highest teacher salaries�Germany, Spain and Switzerland�would presumably be among the best. They aren't. In practice, the top performers pay no more than average salaries. Nor do they try to encourage a big pool of trainees and select the most successful. Almost the opposite. Singapore screens candidates with a fine mesh before teacher training and accepts only the number for which there are places. Once in, candidates are employed by the education ministry and more or less guaranteed a job. Finland also limits the supply of teacher-training places to demand. In both countries, teaching is a high-status profession (because it is fiercely competitive) and there are generous funds for each trainee teacher (because there are few of them). South Korea shows how the two systems produce different results. Its primary-school teachers have to pass a four-year undergraduate degree from one of only a dozen universities. Getting in requires top grades; places are rationed to match vacancies. In contrast, secondary-school teachers can get a diploma from any one of 350 colleges, with laxer selection criteria. This has produced an enormous glut of newly qualified secondary-school teachers�11 for each job at last count. As a result, secondary-school teaching is the lower status job in South Korea; everyone wants to be a primary-school teacher. The lesson seems to be that teacher training needs to be hard to get into, not easy. Lastly, the most successful countries are distinctive not just in whom they employ so things go right but in what they do when things go wrong, as they always do. For the past few years, almost all countries have begun to focus more attention on testing, the commonest way to check if standards are falling. McKinsey's research is neutral on the usefulness of this, pointing out that while Boston tests every student every year, Finland has largely dispensed with national examinations. Similarly, schools in New Zealand and England and Wales are tested every three or four years and the results published, whereas top-of-the-class Finland has no formal review and keeps the results of informal audits confidential. But there is a pattern in what countries do once pupils and schools start to fail. The top performers intervene early and often. Finland has more special-education teachers devoted to laggards than anyone else�as many as one teacher in seven in some schools. In any given year, a third of pupils get one-on-one remedial lessons. Singapore provides extra classes for the bottom 20% of students and teachers are expected to stay behind�often for hours�after school to help students. None of this is rocket science. Yet it goes against some of the unspoken assumptions of education policy. Scratch a teacher or an administrator (or a parent), and you often hear that it is impossible to get the best teachers without paying big salaries; that teachers in, say, Singapore have high status because of Confucian values; or that Asian pupils are well behaved and attentive for cultural reasons. McKinsey's conclusions seem more optimistic: getting good teachers depends on how you select and train them; teaching can become a career choice for top graduates without paying a fortune; and that, with the right policies, schools and pupils are not doomed to lag behind.